Material: The Gold Coffee filters are made from Surgical-Grade Stainless Steel coated with gold tone. 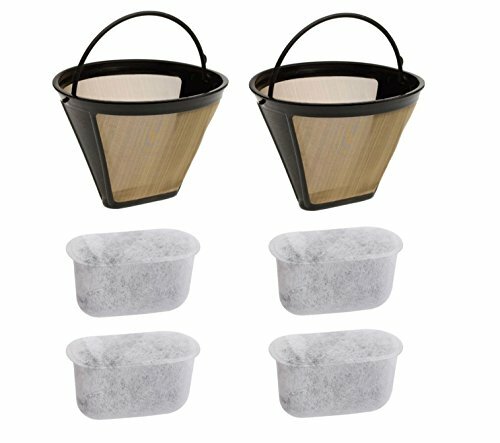 Full-flavored: The filters are designed with minuscule openings to allow all of coffee, carriers (colloids) flavor through while holding back all grounds for richer tasting coffee. Eco-friendly: permanent and reusable, esaily place in the filter holder and fill with ground coffee. And it is safe to clean in the dishwasher after emptying grounds. Charcoal water filters also fits: BC-00PC2 CBC-00 CBC-002 CBC-00BJ2 CBC-00BWBJ CBC-00BWPC CBC-00PC2 CBC-00PC4 CBC-00PC5 CBC-00SA CBC-00SA2 CBC-00SA3 CBC-00WPC CBC-4400 COD-400PC DCC-100 DCC-1000 DCC-1100 DCC-1200 DCC-1400 DCC-15BKBJ1 DCC-15WBJ DCC-200 DCC-2000 DCC-2200 DCC-2400 DCC-490 DCC-490BJ DCC-490SA DCC-590PC DCC-900 DCC-900BK DCC-KE12 DGB-500 DGB-600. If you have any questions about this product by Podoy, contact us by completing and submitting the form below. If you are looking for a specif part number, please include it with your message.